This passage of Scripture describes the conflict that many of us struggle with on a daily basis. As we listen to the news today, it’s easy to become overwhelmed with the needs of our world and communities. Where do we begin? Are we like Martha, running from one cause to another and not feeling particularly effective in any one, trying to do it in our own strength? Martha’s behaviour shows how our pride can corrupt even our best intentions. Martha became so immersed in busyness that she took her eyes off of Jesus. Her misguided focus allowed resentment and a critical spirit to take over. A few years ago I was involved in the founding of a compassion ministry—a residential home for pregnant and parenting teens in our town. We struggled for a number of years with funding issues and staff challenges. We prayed for God to intervene and provide what was needed to serve these young women. When we were forced to close, I felt angry. After much prayer, he gave me a peace about the situation, and I realized that while I was working hard trying to keep the home open, my focus had not always been fully on him and his plan. Martha’s story is a reminder of what we are called to do. 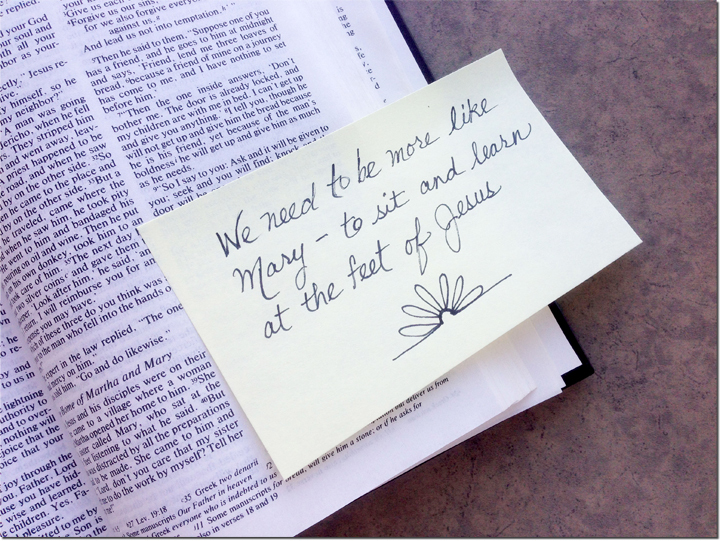 Yes, we need to be involved in ministries that show compassion to those around us, but we must never forget that we need to be more like Mary—to sit and learn at the feet of Jesus. When we spend time with him daily, worshipping and focusing on his Word, it will put things into perspective and enable us to serve others over ourselves. 1. Have you been relying on your own strength and plan to show compassion to others? 2. Have you ever become resentful or critical of others who weren’t serving as much or as hard as you? Janice Buck is National Coordinator of Alliance Parish Nurses. Parish nurses are Christcentred registered nurses who work with the church to teach health education and offer health counselling, referrals, and advocacy.